We are leading manufacturer of stainless steel pudding plate or set. Different pudding set in different box shaps. 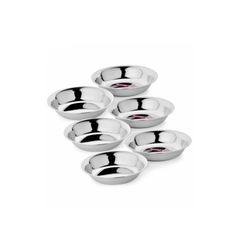 One main Bowl with cover and six serving bowls with spoons. 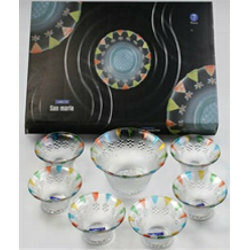 Alok industries presents a magnificent range of gift sets. Beautiful combination of colours, intricate designs and an overall rich look. Choosing from the range of irresistible designs, colours and styles, we admit, will be difficult as each one gently holds on to your attention. This bowls have a very attractive prints to choose from. It can be customised as per customers needs. These bowls comes in different sizes. Being a most reliable organization, we are engaged in offering a wide range of Pudding Set.